You can configure what attributes that get populated as asset data. These attributes can come from Tanium or a configured source. These attributes become the columns that you can include in your reports. When you install Asset, solution content is installed. Some of this solution content is similar to the content packs that got imported when you installed Tanium. In most cases, the Asset version of the content adds attributes or improves the information beyond the existing sensor. For example, the Asset CPU sensor includes columns for speed, cores, and processors, but the CPU sensor from the Initial Content - Hardware content pack contains one column. The Asset custom content is hidden on the Content > Sensors page. By default, Asset imports about 65 common attributes from Tanium sensors. To view the list of default attributes, go to the Asset menu and click Inventory Management > Attributes. You can sort by Name or Data type. Select the type of sort from the drop-down menu. To toggle the sort order, click Toggle Sort Order . To filter the list on the selected sort type, type your search in the search box. For example, if you have Name selected, the search is on the Name field. To edit an individual attribute, hover over the attribute name and click Configure . You can import attributes from Tanium sensor data. For example, you might choose to import other critical configuration information from other Tanium products, solutions, or custom content. Remember that each attribute you add increases the number of saved questions that are asked during the data import process. Each new attribute also adds columns and data to the Asset database. From the Asset menu, click Inventory Management > Attributes. Click New Attribute. In the Source field, select Tanium. You can search for and select the sensor from which you want to add attributes. To view all of the Asset custom content, you can search for Asset in this sensor list. From the list of available attributes that display for the sensor, select the attributes that you want to import. Click Save and verify that the changes are correct. This step makes changes to the Asset database. Review and verify carefully. After the database updates are completed, you can see the new attribute in the main list of attributes in Pending state. The new attribute stays in pending state until the next time the Asset Import Data Sources job runs, and data gets populated in the database. To run this job immediately, see View schedule and run import. When populated, the attribute displays in Ready state. You can add attributes that are in Ready state to custom reports. You can also import attributes from an external data source. If you are importing data into Tanium from an external data source, configure the import first. Configuring the source defines which database tables to import and how to correlate the data with the ci_item table in the Asset database. See Configuring sources. In the Source field, select the data source that you configured. You can search for and select the column that you want to add as an attribute. From the list of available attributes that display for the source, select the attributes that you want to import. After the database updates are completed, you can see the new attribute in the main list of attributes in Pending state. The new attribute stays in pending state until the next time the External database job runs, and data gets populated in the database. To run this job immediately, see View schedule and run import. When populated, the attribute displays in Ready state. You can add attributes that are in Ready state to custom reports. 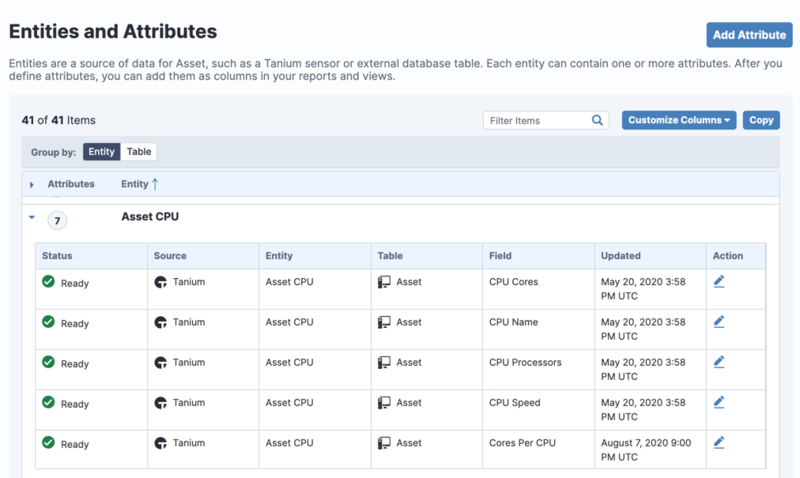 The import asset data schedule determines how often Asset pulls data from Tanium or an external data source to save in the Asset database. This database is used to provide information for offline assets. From the Asset menu, click Inventory Management > Schedules. In the Asset Import Data Sources section, the schedule is displayed. Click Run Now to override the schedule and have Asset immediately pull source data into the Asset database. If you have any attributes that are in Pending state, you can watch the attributes change to Ready state on the Inventory Management > Attributes page. You can add attributes that are in Ready state to custom reports. If you want to change the import schedule, update the asset source. See Configuring sources. 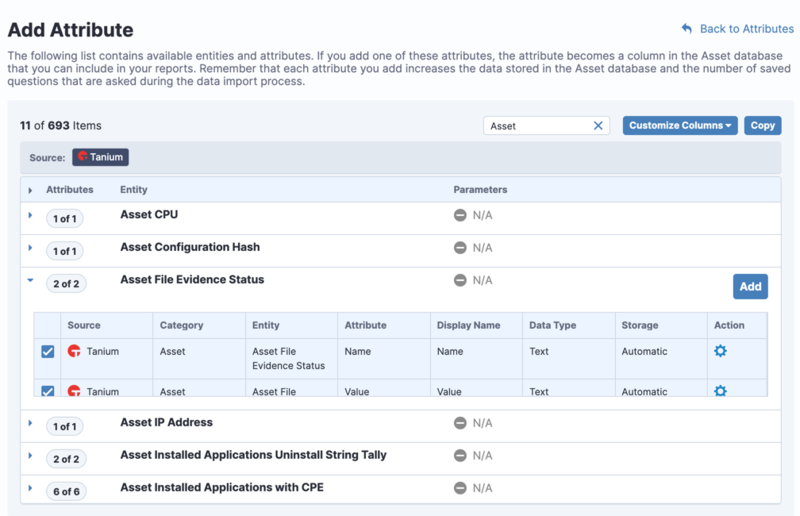 In addition to the Asset user roles that control access to Asset reports and settings as a whole, you can define more detailed permissions on individual Asset attributes. For example, you can create permissions that assign a user group permission to access information about Windows or Mac platform assets only. If a user belongs to multiple user groups, the permissions for all the user groups are combined with an OR operator. Before you begin, you must have a user group to which you want to assign the Asset permissions. See Tanium Core Platform User Guide: Managing user groups. For the users in this user group to access Asset, they also must have an Asset user role assigned. See User role requirements. From the Asset home page, click Settings . Click the User Group Permissions tab. Click Create User Group Permission. Click Add User Groups. Select the user group from the list that you want to assign. Add a Permission Condition. This list of attributes is from the ci_item table of the Asset database. For example, to assign the user group permission to view Windows assets only, set to OS Platform contains Windows.